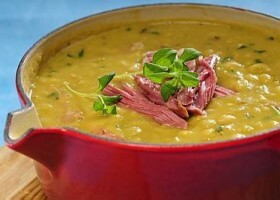 This is a traditional Finnish recipe for a classic soup of green split peas and ham hock thickened with a flour and butter roux and flavoured with mustard that is typically served on Shrove Tuesday. Wash and pick over the split peas then put in a large bowl, cover with water and set aside to soak over night. The following day, drain the peas, transfer to a large pan, add the ham hock and pour in about 3l water. Bring to a boil, cover and simmer very gently for about 90 minutes, or until the peas are tender (take care the mixture does not boil over) and the ham hock is cooked. Remove the ham hock and set aside to keep warm. Take the pea mixture off the heat and allow to cool slightly then blend until smooth in or use a handblender. Once all the peas have been processed remove from the pot, melt the 3 tbsp butter in the pot (the one used to cook the peas). Scatter over the flour and stir into the butter to make a roux. Gradually pour the peas back in, stirring to ensure that the mixture is smooth. Strip the meat off the ham hock and shred finely and add to the soup. Now work in the mustard and season the soup with salt and black pepper, to taste. Bring the soup to a simmer and allow to heat though. Once hot take off the heat and fold in the whipped cream. Ladle into warmed soup bowls and serve.